That Pesky Savior! He Won’t Let Me Hide Behind the Corporal Works of Mercy to Avoid the Rest of the Gospel. The Twentieth Friday of Ordinary Time; or, the Memorial of Saint John Eudes, Priest. …or, any lessons from the common of Pastors for One Pastor, or the common of Holy Men & Women for Religious. 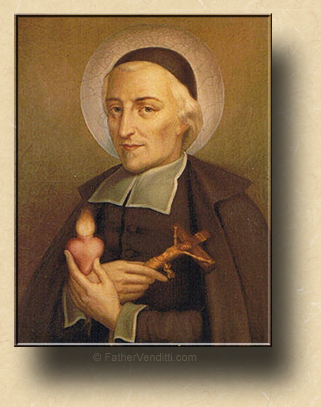 The Third Class Feast of Saint John Eudes, Confessor. • Mark 5: 22-25, 35—6: 1. 10:36 AM 8/19/2016 — Before we reflect together on today’s Gospel lesson, a few words should be said about today’s saint. John was born in 1601 of good, devout parents at the village of Ri in the diocese of Seez. While yet a boy, when he was refreshed with the Bread of Angels, [that is, when he received his First Holy Communion] he vowed perpetual virginity. In the schools, where he pursued his studies in a praiseworthy way, he shone for his wonderful piety. He loved the Blessed Virgin above all, and burned with great charity for his neighbor. Having joined the Berullian Congregation of the Oratory, he was ordained priest at Paris. He was made rector of the house of the Oratory at Caen, but left it, although sadly, to educate suitable young men for the ministry of the Church. To this end, with five companions, he founded the congregation of priests to which he gave the most holy Names of Jesus and Mary, and opened the first seminary at Caen, which was followed later by many others. In order to call sinful women back to a Christian life, he founded the Order of Our Lady of Charity. Of this noble tree, the Congregation of the Good Shepherd of Angers is a branch. [Angers is the name of a town.] He also founded the Society of the Admirable Heart of the Mother of God and other charitable institutions. Burning with a singular love for the most sacred Hearts of Jesus and Mary, he was the first to think—not without some inspiration from God—of offering them a liturgical cult. As an Apostolic Missionary, he preached the Gospel to many villages and towns. Worn out with his great labors, he died peacefully on the 19th of August, 1680. Famous for many miracles, he was numbered among the Blessed by Pope Pius X, and among the Saints by Pope Pius XI on the day of Pentecost in the holy year, and his Office and Mass were extended to the universal Church. Now, here at the Shrine we're always praying for the triumph of Mary's Immaculate Heart, but we don't often ask for the intercession of Saint John Eudes in that quest. 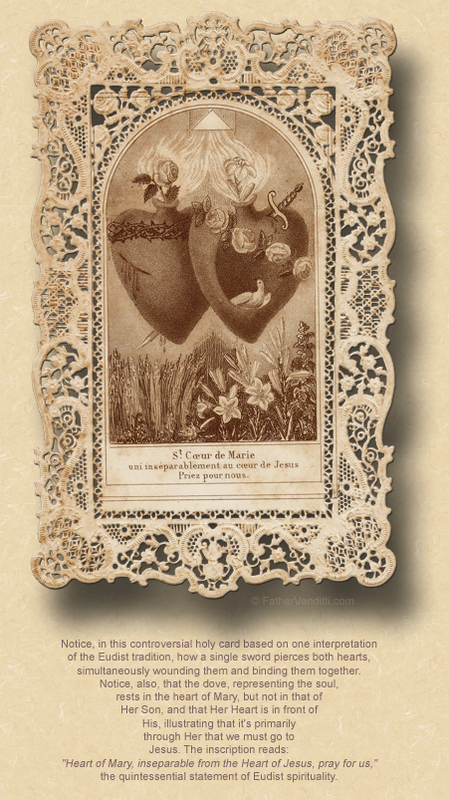 His Congregation of the Hearts of Jesus and Mary is present here in this country, but not as extensively as in his native France, where they are known simply as the Eudist Fathers. When I was two years ordained, I made a pilgrimage with four other priests to a variety of Holy places in France, and we had the privilege of staying in the Eudist Fathers' house of studies in Paris, which is where I became acquainted with this saint. So, as we continue to pray for the triumph of Mary's Immaculate Heart, I would like simply to recommend that we invoke often the intercession of this great saint. I would also like to suggest that his life, in which he moved from place to place, first in this group and then in that, is a testimony to what we've talked about many times here in this chapel about letting the Lord lead us where he wants us to go, even though it turns out not to be what we had in mind for ourselves. Today’s Gospel lesson begins with a circumstance which may seem strange to you: the Pharisees feeling a little bit of encouragement over the fact that our Lord had sparred with the Sadducees over the question of the resurrection of the dead, and pretty much made mincemeat of them in the debate, the incident occurring in your Bible just before today’s lesson. A long time ago I had explained how there were two distinct classes of rabbis in our Lord's time: the traditionalist wing of the rabbinical class called the Sadducees, and a more progressive group which is first evidenced in the Books of Maccabees, just sixty years or so before the time of our Lord, called the Pharisees. The Pharisees were radical in a number of ways, but two elements of their theology stand out: they preached a resurrection from the dead, which the Sadducees rejected; but, more to the point, they instituted the synagogue service which enabled the Jewish people to gather for prayer on the Sabbath without making the journey to the Temple in Jerusalem. But synagogue worship was very different from temple worship. The service in the temple was a sacrifice: an animal, usually a lamb, was slaughtered and burned on the altar. The synagogue service was not a sacrifice: it consisted of reading from, then commenting on, the Holy Scriptures; and, this really angered the Sadducees. The Sadducees viewed the synagogue service in much the same way that you and I would view a Protestant service: they read from and talk about the Bible, but there's no sacrifice, so it's not real in a sacramental sense. That's exactly how the Sadducees viewed the synagogue. The synagogue service was very orderly and regimented. It began with the Shema prayer from Deuteronomy 6: 4: שְׁמַע, יִשְׂרָאֵל: יְהוָה אֱלֹהֵינוּ, יְהוָה אֶחָד. Sh'ma Yis'ra'eil! Adonai Eloheinu, Adonai echad: “Hear, O Israel! They Lord is God. The Lord is One.” And the Shema prayer is, in fact, the first of the two Great Commandments referenced by our Lord today. It's what a devout Jew will tack on the door-post of his home. The second commandment is found in the Book of Leviticus: “Do not seek revenge, or bear a grudge for wrong done to thee by thy fellow-citizens; thou shalt love thy neighbour as thyself; thy Lord is his” (19: 18 Knox). What is new in the teaching of Jesus is the fact the He puts these two commandments together and puts them in a certain order. This one is first, and the other is second. That's the point that Jesus is making. And when you think about it, you can see how important a point that is for us in our time. There are too many today who seek to assuage a guilty conscience by having recourse to the Corporal Works of Mercy. That's not to say that they aren't important, or that they don't cancel a multitude of sins, because they do; and, we know our Holy Father is encouraging us to rededicate ourselves to the care of the poor and the needy. I'm not contradicting him, but only pointing out the danger: the danger of reinventing the Gospel of Jesus Christ, seeing it as nothing more than a blueprint for social justice, and Christian living as simply a matter of feeding the hungry and sheltering the homeless, having little, if anything, to do with how we live our private lives. This is rooted in the inability of modern man to acknowledge a truth outside of himself, which results in him professing a religion of which he knows little, making it up for himself as he goes along. Christians who think this way are really the Sadducees of our time, who, like their counterparts of the first century, think that they have it all figured out. And it takes the Divine wisdom of Our Lord to put it all back in perspective so simply: yes, we must do good for others;— that is a part of the Gospel message—but, we must do it for the right reason. It is not our good works themselves that please God, but the fact that they are done for Him, in conjunction with an otherwise holy life; just as the Psalmist says, "…here, O God, is my sacrifice, a broken spirit; a heart that is humbled and contrite thou, O God, wilt never disdain" (51: 19 Knox). Practically speaking, we have to look at our own lives. How many of us think that we are all right before God because of all the wonderful things we've done for our fellow man or even for the Church, when the real question should be: "When was the last time I went to confession? When did I last really prepare myself for Holy Communion? When did I do something for God that wasn't rooted in the social gospel but rather in the moral gospel?" God want's our good works only if they bring us closer to Him and motivate us to live holy and moral lives; otherwise they are worthless to Him. All that is important to God is that we are His: heart, mind, and soul. As we offer up together the Sacrifice of the Lord's Body and Blood, let us remember that, if we can't offer ourselves, then we have nothing of value to offer. * The central figure of one of the largest mass conversions—and martyrdoms—in Christian history, the Centurion Andrew, prior to a battle with the Persians toward the end of the third century, converted all 2,593 men under his command, then went on to win a decisive victory for Rome; but, Emperor Maximian, fearing an entire army of Christians in his empire, ordered him put to death along with the entire Legion.